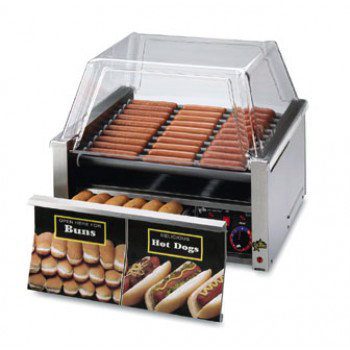 Hot Dog Roller Grills are designed to handle the high-volume demands of the busiest food operations. Available in a variety of sizes with capacities from 20 to 75 hot dogs, hot dog rollers are a safe, easy and profitable way to cook and merchandise this fast food staple. When selecting a hot dog roller grill, consider the capacity and what other products you will be cooking to determine the roller finish you need. Hot dog grills with chrome finish rollers provide a sturdy cooking surface for traditional use while a non-stick surface provides a high-performance coating that supports a diverse menu selection including egg rolls, taquitos, breakfast sausages and more. For advanced controls and improved product quality, select a hot dog roller with electronic controls that contain programmable cook & hold controls and multi-zone temperature controls.